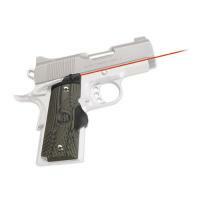 Crimson Trace LG-911 LG-911 Master Series 1911 Compact Green G10 Laser Grips FREE SHIPPING! The Crimson Trace LG-911 Master Series 1911 Compact Green G10 Laser Grips is the firearm accoutrement that will make your fellow marksmen green with envy. The device features a 5mW red laser (the grip is green and NOT the laser), hence a Crimson Trace LG-911 sight is a sidekick with accuracy that's unmatched in the industry. The LG-911 does John Browning's classic 1911 design justice by respecting its contour and attaching seamlessly. What has now become synonymous with the Crimson Trace stellar reputation, the LG-911 Master Series Laser Grips feature Instinctive Activation™ which means the light is engaged upon removal from the holster and no need to fumble with a power on switch. The LG-911 is fully adjustable by the user to windage and elevation, as a G10 Grip that is textured to disallow slippage, and the activation pad is a rubber overmold that has unparalleled durability. The LG-911 comes with a limited three year warranty. **Fits Colt (Officer and Defender), Kimber (compact, ultra-carry and ultra-elite), Para-Ordnance (compact, single-stack), Springfield Armory (compact and ultra-compact) Wilson Combat and most other 1911s with grip screws measuring 2-11/16" apart. ©2002-2019 CopsPlus.com: Crimson Trace LG-911 LG-911 Master Series 1911 Compact Green G10 Laser Grips FREE SHIPPING!